Photo measuring 4.5 x 2.75 inches. Remnants of black photo album paper still glued to the back. This one is a bit of a mystery to me. At first glance, it’s just a nicely dressed matron on a downtown sidewalk. 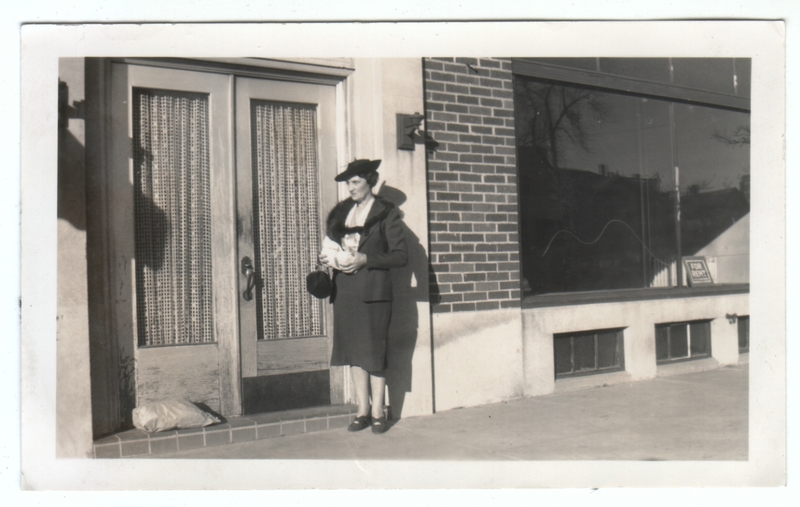 But look twice, and you realize she’s just standing there, holding a mysterious parcel. Is she trying to make a delivery? Is she waiting patiently after knocking on the door? The storefront is vacant and there are no lights in the sconces. Should the other abandoned package be a clue that nobody is going to answer the door? The harsh light and long shadows create a stark mood, and though it could be argued that the presence of the photographer means she’s not strictly alone, she nevertheless conveys an air of alienation. Something about this photo always reminds me a little of the paintings of Edward Hopper, as if he took this snapshot as a reference while creating a work like this. It almost has a staged feel to it, and yet for all appearances it seems to be an ordinary photo that somebody glued into a photo album. It’s likely there’s a simple explanation. Perhaps she was a relief worker delivering alms to the poor, somebody came along to document her work for the organization’s newsletter, and she proudly kept a copy in her scrapbook? Who knows. In any case, like an Edward Hopper painting, I think this photo is both beautiful and faintly unsettling. it is the morning of her first day at work. the parcel is her lunch. LOL, I can’t either, that’s why this photo is such a mystery to me. You hit the nail on the head! Weird details I noticed zooming in: is the sconce to the right of the doorway missing a bulb? Or was it a gas jet? Was the curvy scratch on the window the mark of a vandal? Also, I suspect her parcel is meat from the butcher (but I might just be thinking that because I recently brought home a very similar parcel from Berkeley Bowl). Thanks! I’m not sure about those details. Even if the sconce were a gas jet, I would have expected some sort of glass covering for it, but it seems there’s just nothing there. I wonder if the wavy line on the window is the remnant of some previous window display? And a parcel of meat is as good a guess as any, I’d say. Eerie. If this were a painting, the “For Rent” sign would be a clue. Eerie indeed. Your reference to “a clue” makes me think this is like a mystery photo, where a short mystery is presented in written form, and then a picture is presented full of all the clues you need to solve it.